“Risks in the housing market appear broadly contained. 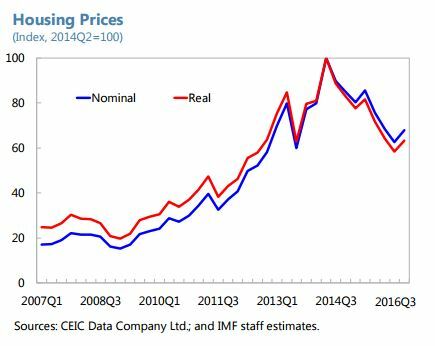 Housing in Macao SAR experienced a remarkable boom: between end 2008 and mid-2014, prices rose by over 500 percent (nearly 400 percent in real terms). To some degree, this asset appreciation can be explained by fundamentals including rising real wages, financial deepening, and population growth amid a relatively fixed supply of land. In the period since mid-2014, prices have partially corrected, falling by over 30 percent, and are back at 2013 levels. However, only 0.1 percent of residential mortgage loans have negative equity (and nonperforming loans are roughly the same magnitude).2 This strength in asset quality likely owes to three factors. First, for most homeowners, prices are still above the purchase price given the size of the initial boom and the short period of the recent correction. Second, the average loan to value remains well below regulatory maxima. And third, average debt service to income has been consistently low at 25 percent. According to the most recent data, real estate prices and transactions have started to increase again, suggesting that the correction may have bottomed. In light of these dynamics, the current macroprudential stance appears appropriate. An easing of macro prudential standards would be an appropriate response in the event of a rapid and self-reinforcing decline in housing prices that posed risks to financial stability and the broader economy.3 Current indications suggest, however, that existing standards remain appropriate, including the loan-to-value ratio and debt service-to-income ratio applied in Macao SAR. While house prices have fallen, the adjustment has been orderly and the market appears to be stabilizing without any significant stress on balance sheets or financial stability.